Chicago Tribune, March 7 and 8, 1914 [click on images to enlarge]. The cartoon is by John T. McCutcheon, same guy who drew this one. He seems to have had an enduring interest in the phenomenon of the unprosecutable female murder defendant. The defense attorney’s contention that a female jury would be easier and not harder on Stella C. is not supported by this previous posting on the subject. But who knows? 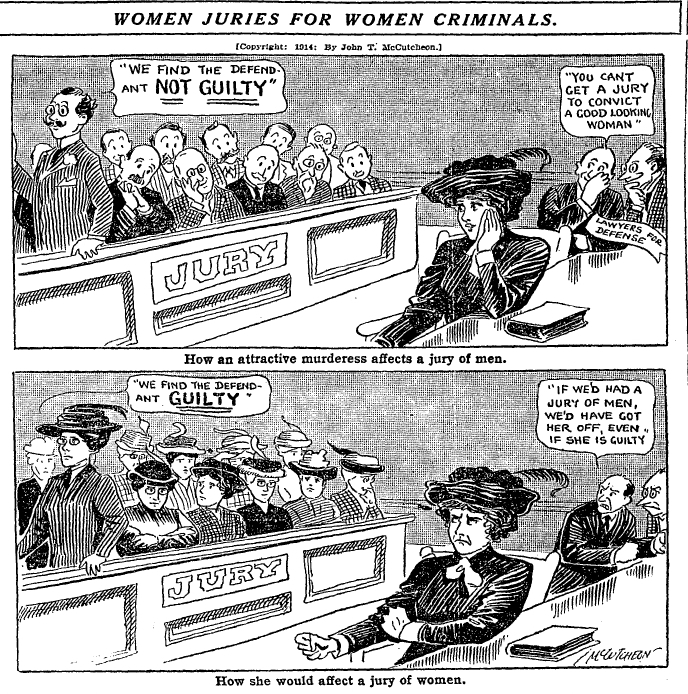 I can’t help noticing that th “attractive murderess ” , as she is rendered before the female jury , is actually a bit of a boiler. Well that’s surely part of the point. Unimpeded by little-head cognition, the matronly jury can see her as she truly is. All murderous and whatnot.